"The ring arrived today. It is a perfect fit and I am very happy with it. Definitely worth the wait. Thanks again for working with me on the shipping." "I just rec'd the rings and I might say that you folks did an outstanding job with them and they look wonderful. I wish to thank you again for the wonderful service that you and your team have done. Thank you again. And I hope to do shopping with you company. "I just received my ring and it is absolutely beautiful. The design is just breathtaking and I will enjoy wearing it everyday. Thank you so much for your help and I will definitely buy from you again. "Thank you for a pleasant return process and I would recommend this company to my family and friends. "I can't believe how easy it was to order and I am elated that it arrived on time. I didn't have any problems whatsoever and I was more than impressed with the merchandise. It actually was more beautiful than I thought it would be. This is the ONLY way to shop for jewelry. Thanks for a pleasant experience. I'm looking forward to a long relationship." "I was a little leery about buying jewelry on the web. However, when I saw your sight, I was impressed with the quality of the pictures, description and stats on the jewelry itself, and most especially the pricing! Not only was that good, the shipping was exremely fast! I will most definitely use your site again, and again. Thanks very much!" "Awesome! The lady that I spoke with on the phone was extremely friendly and went way beyond the call of duty to help me find what I was looking for...GREAT Place!!" "My husband and I have placed two different orders from Oroking. Both orders arrived immediately, nicely gift wrapped and were quality merchandise priced very fairly." "I've done several transactions with OROKING and they are the best. Great quality, great price, good shipping. My girlfriend thinks I really know what I'm doing." "The price I paid was excellent. The watch got here quickly and everything went very smoothly. For the man who hates mall crowds this is the perfect way to shop." "OROKING did a great job of keeping me informed about the status of my order, and shipping was prompt. Online ordering was fast and simple. The price was great. I am very satisfied." "I was very pleasantly surprised by the quick turnaround (I received my order within two days) and the quality of the merchandise. This was my first "internet" purchase and it was a quick, painless and altogether quite excellent experience. Can't wait to go shopping again! Good Job Oroking.com"
"Finding, selecting and ordering page was very good. Confirmation was fast. Delivery was just fine. I am wearing Earrings every day. Thanks!" "When I ordered the necklace, I received a phone call from a representative from oroking.com indicating that my purchase wouldn't arrive before Valentine's Day unless I authorized express mailing. I did authorize that and received my purchase the next day. I appreciate their initiative in informing me on the progress of my order." "Good Internet interface, ordering and delivery. The good price was also a very positive asset. Recently, in North Palm Beach, Florida, I was able to purchase a similar ring for $375 which had been reduced from $499. All that and the ring from Oroking was only $229.00 Thanks." "I am very pleased with the service I received from Oroking.com. I received excellent service and assistance. I would recommend this site to everyone." "Prompt delivery and a great product." "GREAT prices and exceptional customer service! Their warm and friendly assistance led me to pick out a gift that was terrific, and it arrived earlier than expected. Special thanks to Fred! 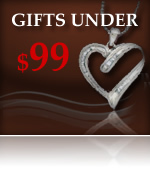 I will not shop anywhere else for jewelry and gifts... you have me as a customer for life." "The necklace and bracelet I ordered were outstanding and came wonderfully packaged. I will order from them again." "I'm delighted with my purchase. Although I searched for the similar item on other jewelry sites and did some comparison shopping, no other site came close to Oroking.com . The price was outstanding, the quality top-notch." Email us your testimonial to be included in our website.